This water purifier from the early 20th century worked on the principle of passing water through a carbon or charcoal filter. It is like water filters in homes today. The tall stoneware ceramic container has a lead free glaze. Its domed lid has an interior ridge to prevent it from slipping off. Near the base of the container is a hole leading inside the container. A small metal tap blocks the hole, allowing water to be drained out of the container when required. 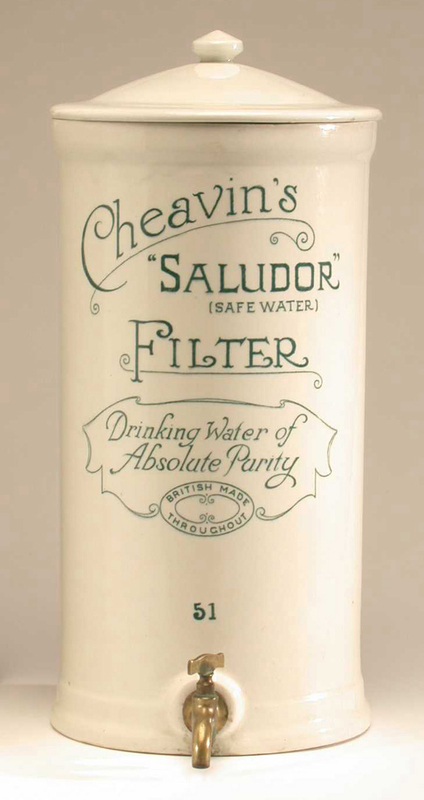 On the outside of the container are the words 'Cheavins Saludor Safe Water Filter. Drinking Water of Absolute Purity, British Made Throughout'. The filter system was inside the container. The container would be filled with charcoal, and water poured into the top of the container. As the water passed through the charcoal it was cleansed. The clean water was drawn from the bottom of the container through the tap. Charcoal is pure carbon, made from the partial burning of organic waste. It contains ions that help to kill germs, and it works on the principle of absorption. Large amounts of gases, including poisonous ones, and gases that create bad smells and tastes in water stick to the charcoal. It is porous, and has, therefore, large surface areas that absorb gas.